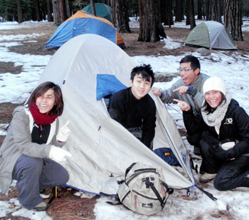 The top of this page is a collection of mistakes made on De Anza College Outdoor Club trips, mostly from our winter Yosemite camping. Well, some are mistakes, some are just plain irresponsible. It is compiled in the hope you won’t do any of the following and you can skip getting the nickname “the mooch,” “the princess,” “the flake,” “that guy with the tent that collapsed,” “the jerk who wouldn’t latch the bearproof,” “the fool with the shoes that wetly squish with each step,” or “that slob who would never take trash to the dumpster.” If you have spares of gear, we hope you will bring them along on our trips to help out the planning impaired. For some advice on the better, happier way to do things go to Have more fun camping and follow one or more of the dozen links. Left their sense of humor at home. Borrowed a tent, didn’t try pitching it before the trip, and found out on the trip that it was missing crucial parts. 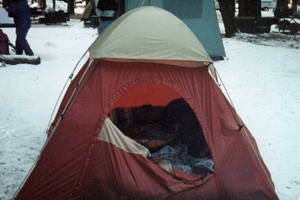 On the 1996 winter trip, a guy brought a giant box-shaped fabric and plastic sheeting contraption to sleep in. People riding with him and who were going to share sleeping accommodations, thought he said he was bringing a ‘tent.’ They were lucky and found space in other real dome-shaped, winter-rated tents as soon as they saw his alleged tent. 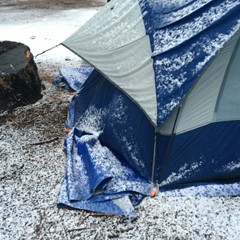 He slept alone in his until the weather hit, then squeezed into another tent. Arrived in good weather, pitched their tent badly, and left the rain fly poles sitting on the ground outside. When it rained and the tent leaked and their sleeping bags got soaked, moved to hotel rooms. Didn’t arrange to borrow a tent, or arrange to share space in a tent, just came and expected there would be space. Brought only a simple cotton-stuffed sleeping bag with no extra blankets on a winter trip – thought they’d be warm sleeping in their jacket – got warm by shivering. On the 1995 winter trip, two guys showed up at the campground, went to the faculty advisor and said “we need sleeping pads.” They knew the club had some to borrow but had not arranged in advance for them. 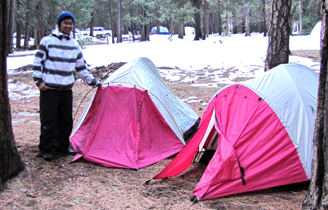 Brought no insulating sleeping pads on the Yosemite winter trip, despite being repeatedly told that the club recommends two per person, even if you have an air mattress. Convinced his tent mate to loan him one of his when he found it impossible to get to sleep with only a sleeping bag between him and the very cold ground. Didn’t make arrangements for a ride, just showed up when carpools met to leave and figured there would be room (oh, and he had a bike he wanted to bring and a bunch of food that needed refrigeration, and he figured someone would have room for it in their ice chest). You might guess he did not get a ride to go on the trip. Didn’t bring money to pay for their share of gas, park entrance fees, etc. wrote an IOU, and refused to pay later when the driver lost the IOU. Didn’t bring money to pay for their share of gas, park entrance fees, etc., and refused to pay their share, saying that the club ought to pay all the expenses on an over-a-weekend trip we were charging less than ten dollars for. The carpool was running very late. Riders all supposedly agreed to get “fast” food at a quick stop for gas, but two ordered pizza and held up the group. On the 2006 Tuolumne trip, two girls didn’t bring the map they were given showing how to find the group campsite. They arrived at the park at 5 p.m., with plenty of daylight, but gave up looking for the club. Instead of asking a Ranger for help and/or paying for their own campsite, they pulled their truck into an unoccupied site, pitched their tent and moved in. At 10 p.m. the pre-paid, registered occupants arrived and the two girls (well, women, they were in their 40s) convinced them to let them stay. ♥ Well, he had excuses for being tired. The night before a couple of nearby campsites had ignored the quiet hours. It had been a long hike. Late that afternoon he found himself standing in front of his tent, pointing his car door remote at it and clicking away, starting to get a little irritated that the tent door wasn’t unzipping and opening up. A good way to wake up the whole campground is to set your car alarm. Then if a curious animal or clumsy person bumps the vehicle at night you’ve succeeded. Hardly brought any food, just mooched off other people. Didn’t bring a pan. Borrowed one, cooked breakfast, then rushed off to catch the skier’s bus, leaving the pan owner to clean it. Brought only one change of clothes and got both sets wet and had to borrow from people. Borrowed long johns (base layer) while on the trip and didn’t return them. Before we started requiring to see people’s waterproof (not water-repellent) rain pants and hooded rain jackets in advance of the winter trip, at least two people per winter trip have needed temporary rain gear made for them from plastic garbage bags. A girl brought a jacket that wasn’t so waterproof after all, got it soaked, borrowed a jacket from another girl, but didn’t borrow rain gear to keep it dry. It got soaked, so she borrowed from yet another girl, and didn’t keep it dry. She then spent the afternoon in her sleeping bag. This was on one of our winter Yosemite trips and the next day she went to the Sunday brunch, ordered and ate her meal, then announced that she didn’t have enough money. This next guy always complained that his wife packed too much stuff. He didn’t bring a change of pants. It snowed heavily (over a foot) during the evening and he stood near the campfire to stay warm. So the falling snow landed on his blue jeans (worn without rain pants) and melted in. At bedtime they found their tent had collapsed from the weight of snow so they decided to sleep in their car. He took off his wet pants. In the morning it took him quite awhile to get out of the warm sleeping bag and into the then frozen-stiff jeans. We’ve heard that he doesn’t complain so much any more that his wife packs too much gear. This one a parent did in 1998. A dad really didn’t want his daughter to go winter camping. He tried to convince her, but she was determined. She had already paid for the trip and made arrangements to rent gear she needed. So he called the director of Student Activities and complained about the trip’s safety. The director got the Outdoor Club advisor on a conference call and the advisor defended the trip plans, answering every one of his concerns. The advisor thought that some of his ‘concerns’ were a bit over dramatic. It turned out what he was trying to do was get the whole trip canceled as being unsafe just to keep his daughter from going on the trip. Said he didn’t need a map to get to Monterey because he knew the way perfectly, and wouldn’t listen to passengers when they repeatedly said he had missed the turnoff. They ended up 50+ miles in the wrong direction before he was willing to turn around – making the whole carload too late to participate in the event. Instead of reading the trip directions and getting questions answered, got directions off the Internet and took 13 hours to get to Yosemite (most people take 5-6). This carpool started out from De Anza in the evening, drove all night (not a real safe idea) and arrived early in the morning. Said she’d drive for sure, but didn’t tell her parents about the trip until the last minute. They said she couldn’t drive because she had no experience driving in the snow. Her passengers included a guy with experience putting chains on and driving in the snow, and the route she was planning to take has hardly any snow until the last of the drive, which is plowed and patrolled by Rangers, but her parents still wouldn’t let her go, so her passengers missed the trip. Said he’d drive but didn’t plan ahead. Tried to get time off from work at the last minute and couldn’t, so people were unable to get a new ride and had to miss the trip. Said he’d drive, and had convinced his parents to loan the big vehicle. Changed his mind about going on the trip, but didn’t tell people he was supposedly giving rides to until they called him the day before. Told people when he signed up for the trip that he could borrow the family van and drive a bunch of people. Told people at the pretrip meeting a week before the trip that he would give them rides. Waited until two days before the trip to ask his parents if he could borrow the van and they said it wasn’t running well enough. On the February 2003 trip the people who stayed the night before the main group arrived had a raccoon climb up on the picnic table while they were eating dinner. They had been smart and locked their bear-proof campsite food storage locker before they sat down to eat. They said “HI” to the raccoon (did not feed it) and chased it off. A minute later they heard people yelling at the next occupied campsite “hey, get out of there!” and heard the food locker door clang shut. Less than another minute later (really) the same “get out of there” at the next occupied campsite down the loop was followed by yet another bear-proof locker door clanging shut. We’re guessing that some campers learned the hard way to shut their bear-proof locker door immediately after getting things out, especially after dark. Four people tried to share one small water bottle on a long hike, because it’s winter and they didn’t think they’d get thirsty because it’s cold out, not hot and were very miserable and thirsty. Didn’t bring enough water on a long winter hike, thinking they could use a water-purifying pump to refill the bottles, found only solidly frozen water or dried up springs and were very miserable and thirsty. As they got set to go on a night hike, were reminded by people in the next site that they should put their bag of trash in the dumpster or bearproof box before they left, but they still didn’t do it and coyotes got into it even though there were people in the surrounding sites. The people (including one who worked at a local, famous recreation equipment store and acted as though he knew everything about camping) were banned from future club events. 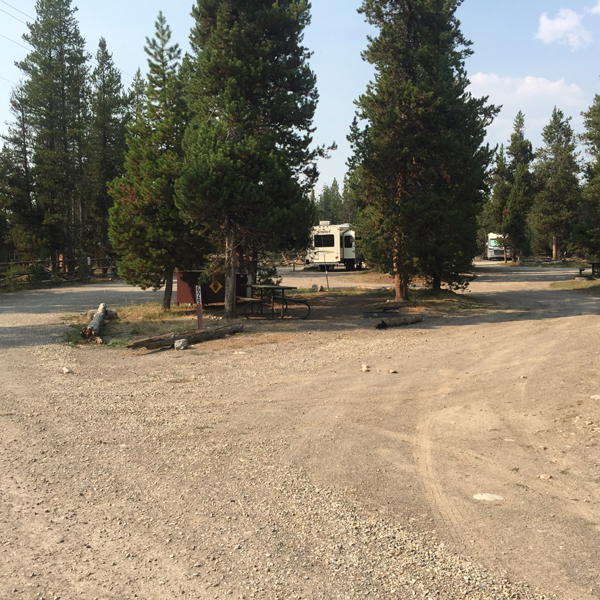 On a trip with multiple campsites, one couple left a blazing fire going in their site when they went to the store. This is against the law and can mean a big fine, so people from another site put out the campfire. When the couple returned from the store they got angry that the fire had been put out. Thought a really big campfire would keep bears out of the campsite at night and so he was a little careless about putting away dirty dishes. Shortly after he finally was convinced to at least put the dirty dishes into the metal locker, a bear jogged through the center of the site, between the locker and the campfire and right past the front of a tent. He said he “screamed like a girl” (even though he said he wasn’t going to do that if he saw a bear) and hopped behind the picnic table. Wore cotton socks on the winter trip even though the Snow or Rain Camp Must-Haves webpage says not to more times than anybody can count. Wore plastic bags inside their boots because their boots weren’t waterproof after all. Girls hung out in the heated restroom on the winter trip to stay warm, and invited a guy in to talk. A couple of girls held up the start of a major all day hike because they needed to do their makeup. The same girls wore watermelon scented lotion in a mosquito area. A group of people decided to ignore De Anza’s rules about no alcohol, other people decided to not notice what was going on because “the advisor will never know,” and the whole trip was canceled half way through as a result. On a 2000 Tahoe trip a girl thought a bottle of tea doesn’t really count as food that would attract bears so you can have it in your tent, or leave it sitting just outside the tent at night. She was repeatedly told she was wrong but didn’t believe people. She left crackers and other snacks sitting out after eating, and wasn’t convinced when she was told by many people that her toiletries should be in the bear locker. People were quite tired of her and were being a bit unfriendly by the end of the trip. One former club officer still screams when he sees Ritz crackers. After raccoons got into the tent in the middle of the night to try to get into his daypack, blamed his mom for packing a peanut butter and jelly sandwich and his toothpaste in the pack. 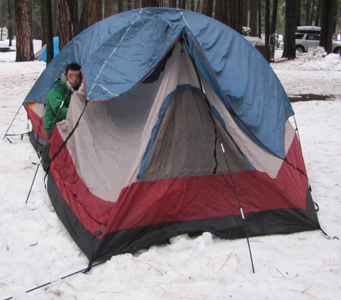 Early Saturday morning on the 2013 winter Yosemite trip we found a torn open pack sitting just outside the entrance to one of the two-person tents. A raccoon had opened the tent and dragged it out, not even waking the people inside. In the second photo, the camper, not knowing how his pack got there, was concerned that perhaps his camera had been stolen, but that was not what the raccoon wanted. In the foreground of the third picture you can see the yellow chocolate bar wrapper (he and the raccoon share a liking for Toblerone bars). Yes, everyone had been asked to triple check their day packs, pockets, etc., before putting gear in their tents. On the ’98 Yosemite winter trip one guy brought a package of bacon to cook. When he was asked what he was going to do with the grease, he said he would dig a hole in the ground and scrape the grease into it. This is against the rules anyplace you camp, including backpacking someplace remote. It’s possibly dangerous to attract animals to the smell and have them digging. It’s rude to the future people who camp there. Can you imagine not knowing someone buried bacon grease in a campsite, and pitching your tent over it, or near it, and having animals harass you all night? Our advice: do a lot of the cooking in advance at home where it is easier to clean up. 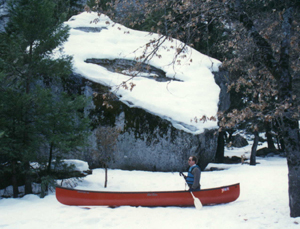 On the 2003 winter hike to the base of/or the top of upper Yosemite Fall we met a family who looked a little cold. They had decided they were too warm hiking in their winter jackets and that the jackets were too much trouble to carry. They had stashed them in the bushes somewhere below. The clouds, which gave us snow, hail and/or rain, depending on which elevation hikers were at, were moving in quite quickly. I wonder if they made it back to their gear in time? Brought a flashlight (electric torch) that requires being squeezed to work and hardly gives out any light each time you squeeze it. Before one winter Yosemite trip a guy told people that he would take anyone to the top of Half Dome. The Outdoor Club has gone there as a day hike or an overnight backpack, but only in the summer when the cables are up. Even with clear trails in summer the 17 mile round trip is considered extremely strenuous and listed as a 10 to 12 (or more) hour round trip. The Yosemite Guide and other sources list the cable route as inaccessible in the winter, but the guy would not listen to the faculty advisor when I told him that he should not be promoting such an idea. He insisted that he was experienced and could pull it off. So your faculty advisor called the Wilderness Center to get some help. I asked why they don’t list the trail as closed. They said the attempt would be incredibly dangerous,and I should tell everyone that they absolutely recommend it is not tried. When I asked why they don’t have a regulation against it, they said “we can’t outlaw everything that is stupid,” and gave the example of people trying to cross a flooding river. Experienced backcountry travelers know that just because a trail crosses water at a certain point doesn’t mean that is the best place to cross all the time, or even that the river or creek can be crossed all the time. But some people still try it anyway. The spokeswoman at the Wilderness Center I talked to added that she would like it if I gave her number to anyone who was still convinced to try a winter Half Dome hike because she said she would rather try to talk to someone than have to go out on a (winter) nighttime rescue. 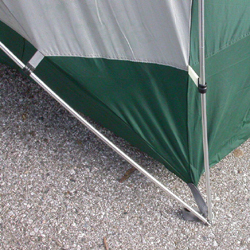 Below is a photo of one of the biggest mistakes you can make camping. Yes, this tent is a dome shape, better than a square box-shaped tent. But the “rainfly,” (the tan cap on the top), is a joke. It won’t keep the interior dry because any rain that falls will run down the cap, onto the main part of the tent and soak in. You need to spend the extra money to get a tent with a full rainfly that goes all the way down. Luckily for this guy (and his girlfriend) it didn’t snow (or rain/snow) during the club winter trip he brought this tent on. 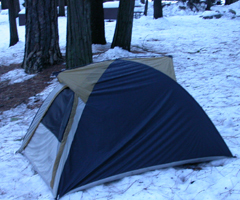 Below is a tent you shouldn’t take camping even in the summer. The roof sags enough to collect a big puddle (even in light rain) that will soak through. Snow would make this tent collapse. Winter, 2004, one guy didn’t follow the advice at Snow or rain camp must-haves. Before rain soaked through this tent we found room in a better tent for him. He was lucky there was room. On the 2017 trip these people pitched their tent incorrectly. (Many tents have instructions printed on the bag, did they read them? 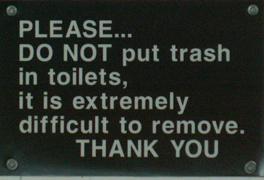 If they borrowed it from someone did they ask for instruction on how to pitch it? Did they try pitching it before the trip?) When they were having difficulty with it they did not ask other more experienced campers they were traveling with for help. In the dark, from a distance, it looked to the other campers as if they were okay. They were found trying to sleep in their car in the morning and complained that their tent was “unstable,” as if to say it was a fault of the construction/design of the tent, rather than their failure to properly put the ends of the rain fly tent poles into the ring pins at the base of the tent. As far as the rest of the group could tell, it looked as though they had just stuck the ends of the rain fly tent poles in the snow. from this page: How to pitch the Cabella eight person tent. He advised a friend “an experienced camper yet…to put stakes in first, but his response was that he wanted to see where the door was before he put stakes in. Mind you, we were camping in the middle of the Mojave Desert (where the only thing you can reliably say about the wind is, “It will be back!”). 25 mph winds with gusts to 35. From Girl Scout camp, as a camp counselor (group leader), the loudest screaming I have heard while camping. Picture six girls late at night in their tent trying to channel someone on a Ouija board. They are all concentrating and very quiet. Next picture two feral cats or possibly raccoons, suddenly snarling and fighting just outside that tent. Picture how fast the camp counselors can run in that direction. Squat with your spurs on. Let your kids ride the elk. Drive fast and pass on curves. YOSEMITE NATIONAL PARK — On the first day of his vacation, Doug Sells, an athlete at the University of Oregon, hiked the Yosemite Falls Trail. When he got to the top — huffing and puffing in 95-degree mugginess, slipping on the fine sand that covers the steep granite trail — he saw him. A man in black jeans, black T-shirt, flip-flops and carrying no water or backpack. The next day on the strenuous 7-mile round-trip Nevada Fall Trail, Sells passed a man in dress pants and dress shoes. But it was what he saw on his hike to Half Dome on Wednesday that stopped him short. Just before the final ascent — so steep it involves pulling one’s self along on cables — thunder and lightning started hitting the peak. A crowd of about 30 hikers turned back, each person’s hair standing up with electricity. “It was like a cattle drive, everyone hurrying down,” Sells said. They could be viewed as Huckleberry Finns in ill-suited footwear, traipsing through a Gore-Tex world; testament that, as rangers like to say, “the park belongs to everyone.” Locals more commonly refer to them as tourons — tourists displaying moronic behavior. Rangers call them PSRs, possible search and rescues. Logs rangers keep contain hundreds of cases of hikers who’ve fallen off trails, suffered dehydration or leg cramps, injured their heads or had heart attacks. Many are air-lifted by helicopter to area hospitals. “One of the things that is so great about Yosemite is that it’s easily accessible, just a few hours from L.A. and San Francisco. But because of that we get a lot of people who come to see the steep cliffs, the waterfalls, and the swift water and are still under the false perception that this isn’t wilderness,” said Deb Schweizer, a park spokeswoman, who verified that yes, Yosemite rangers are regularly asked what time the park puts out the deer in the morning and whether they could turn down the volume on the falls. “For some people, this place is just so outside their reality,” she said. Last year, Yosemite’s Search and Rescue Team responded to 180 incidents, 100 of them involving day hikers, most of whom came from the Central Valley and the Bay Area. In 2001, the rescue team responded to 167 incidents — with more than 100 of those, too, involving day hikers. “We call the day hiker stats our ‘Joe-out-in-the-woods-for-the-day’ numbers,” one ranger admitted. “They trip. They fall off rocks. They get dehydrated because they don’t carry water. They get lost because ‘map’ is a foreign concept. They forget that they have to get back down. On Thursday, Mina Baik, 26, moved swiftly up Mist Trail, which climbs beside Vernal Fall and is the beginning of a Half Dome route. Wearing 3-inch Steve Madden platform slides, she passed throngs of the dutifully booted. Several hikers on their way down told her she might not want to go farther in those shoes. Up ahead, they warned, were steep steps sprayed slick with waterfall mist. Baik wasn’t worried. She’d been hiking before: once. Last year in Maui she followed the Seven Sacred Pools Trail while wearing what she deemed strappier, more fashion-conscious sandals than her Yosemite footwear. It’s not that Baik doesn’t own hiking boots. She has a “really cute pair, with stars” and four pairs of athletic shoes. She just didn’t think to pack them when her parents decided the family would take a spur-of-the-moment trip from Reno. Baik made it up the steps, then she sure-footedly made it down. “Methods. – Yosemite Search and Rescue (YOSAR) personnel record every search and rescue mission on a Search and Rescue Incident Report. The information contained in these reports was used to perform a retrospective review of all SAR missions within YNP during the 10-year study period between January 1990 and December 1999. Results. – YOSAR performed 1912 SAR missions, assisting 2327 individuals and recording 2077 injuries and illnesses. 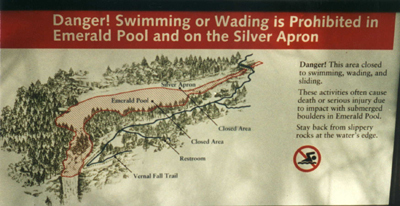 Popular trails in and around Yosemite Valley collectively accounted for 25% of all individuals needing SAR services. Lower extremity injuries and dehydration/hypovolemia/hunger were commonly identified reasons to need SAR services. The duration of SAR missions averaged 5 hours, used 12 SAR personnel, and cost $4400. Helicopter was the primary mode of transport in 28% of SAR incidents. 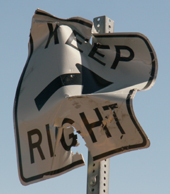 There were 112 fatalities, yielding a SAR case fatality rate of 4.8%. The majority of fatalities occurred while hiking/snowshoeing, with falling the most common mechanism of lethal injury. Road trip advice and etiquette has ideas for limiting boredom, getting along on a road trip and some packing and safety tips. From a NOLS (National Outdoor Leadership School) Wilderness case study: “cold, damp socks is not a sign of toughness, rather, it’s a bad habit.” Serious cold injuries to toes/feet can surprise “people who thought their feet were just a bit cold.” Required gear for De Anza College Outdoor Club camping trips, with lots of advice on gear selection.